Fish has always been a favorite food of mine. I have so many memories of fishing on the lake growing up in Minnesota. Our state is nicknamed "Land of 10,000 Lakes" so where ever you are, there's usually a lake somewhere close by! When I don't have access to fresh fish, I usually buy tilapia. It's easy to cook and you can prepare it with so many methods and flavors. This recipe turned out fantastic!! I love the slight sweetness from the brown sugar and it pairs well with the citrus flavors. The original recipe called for cayenne, but I skipped that because my daughter isn't very fond of spicy foods. It turned out perfect without it! Enjoy! Arrange fish in a single layer in a greased glass baking dish. Combine all ingredients except paprika, and pour over fish fillets. Let stand 15 minutes. Sprinkle paprika over fish fillets. Bake for 20 minutes or until fish flakes easily with a fork. Drizzle sauce over fish when serving. If you liked this recipe, follow the Hot Eats and Cool Reads on Pinterest here! Oh my gosh Im sitting at my desk starving, now I read this Im drooling! I totally just pinned this, have to make soon! Thanks so much for pinning Angie!! This recipe is so delicious!! Tilapia is probably one of my favorite fish. My husband fishes for them here in Honduras at a missionary's place. Thank you for another good recipe. Your welcome Sue! It's definitely one of my favorites too! That looks incredible, thanks for the recipe!!! Yummm! Would love it if you linked up on my blog hop www.w-t-fab.com/search/label/bloghop. Also let me know if you'd like to follow each other! Stopping by from Miz Helen's Full Plate Thursday. 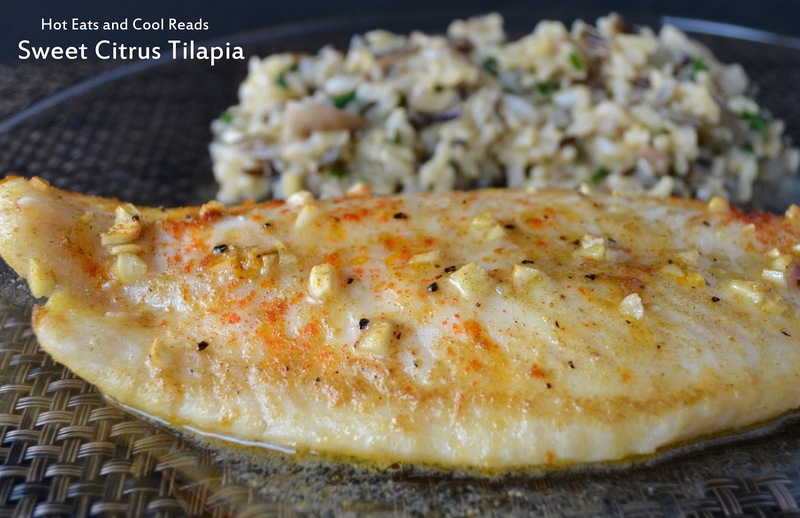 My family loves tilapia, so I can't wait to try this! Thanks for sharing. I just love the combination of the Citrus and brown sugar, this looks like a great recipe. Hope you have a fantastic weekend and thank you so much for sharing with Full Plate Thursday. YUM! I can just about taste this combination and will be trying it the next time we have fish.. I do use tilapia every once in awhile but as we have a fish market close, I usually buy fresh Lake Superior fish. Thanks for sharing on Foodie Friends Friday and remember to come back and vote on Sunday. Thanks a bunch! I saw this recipe on MyRecipes, but I was hoping to find it baked. The best of both worlds!! !